There are as many ways to flavor your barbecued brisket as there are people who love barbecued brisket. A sauce for every pit master, a rub for every cook. However, there are the traditional recipes and there are the general basics. First, however, there is the smoke. The cornerstone of the briskets flavor is the smoke. Since brisket is smoked for a very long time you want to avoid a strong or bitter smoke. If you really like mesquite then I suggest extreme moderation. The usual wood for brisket is a mixture starting with oak. Because of oak's mild flavor, it is a great wood to use. To enhance this flavor try adding some hickory or apple. If you want to go with a marinade for your brisket plan on soaking the brisket in it for a good 24 hours to let the flavor deep into the meat. To make the meat more tender use an acid based marinade. Try using lemon or lime juice or any type of vinegar. Add to this the seasoning of your choice. Brisket is usually seasoned either sweet or hot. For heat, you want to add cayenne or your favorite hot chili pepper. For sweet I recommend you pack the brisket in brown sugar overnight. The sugar will mostly liquefy by morning and can be a sticky mess so make sure if you do this that you wrap it tightly in foil or plastic wrap and put it on a large platter in the refrigerator. You have the world open to you when it comes to rubs, garlic, spices, and herbs. 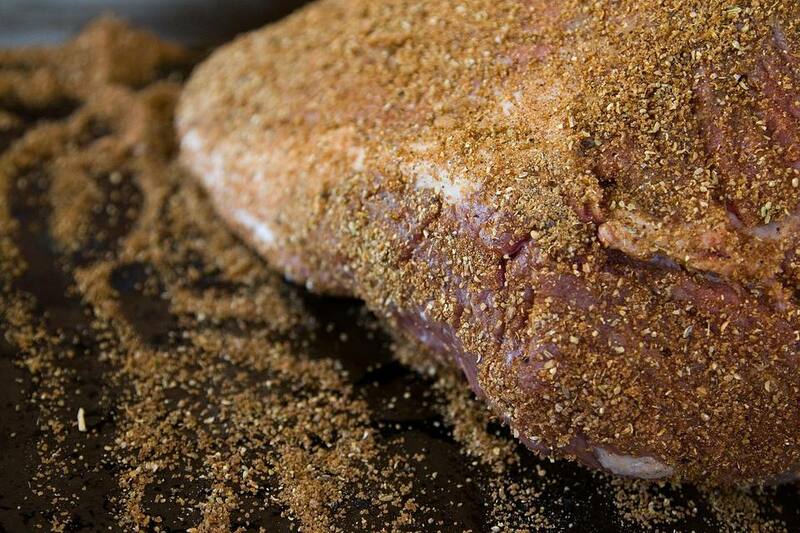 Any seasoning that you fancy will generally make a great rub for brisket. Remember not to over flavor, though. A plain brisket smoked without seasonings is still good eating. Also, remember that if you choose to do a combination or rubs and sauces (mops or finishing sauces) that the flavors should complement and not combat. Try using the same spices in your rub that you do in your sauce. The combination will dig that flavor into the meat and make it great. A mop is basically a baste. Barbecue people like mopping the meat with large cotton cooking brushes, hence the term mop. The legendary pit master, Walter Jetton, actually used a kitchen mop to sauce up his food, but he cooked for very large crowds. Anyway, you use a mop or baste to keep the brisket moist while smoking. The seasoning you add to the mop is just a bonus. A mop should be thin and watery. Adding too much vinegar or acidic juices can make the meat bitter. Also adding too much sugar like that in tomato based sauces can lead to burning, especially in an offset fire box smoker. Keep mops and bastes simple and thin. When I talk about barbecue sauces I usually mean something you add after the food is cooked. Sometimes called a finishing sauce or a table sauce, this can be thicker, sugary, whatever you want it to be. It won't see the fire so it won't burn. Traditionally with barbecue, the sauce sits on the table and each diner can add what they want. Sauces for Brisket usually rely on the tomato but not always.